Last month while visiting Devon Avenue in Chicago, the heart of the city's Indian and Pakistani neighborhood, I popped into a new-to-me store called Al-Mansoor Video. Expecting the usual Shahrukh/Salman/Amitabh sections and everything else except pricey Yash Raj jumbled together, instead I found a squeaky-clean store with films sorted into dozens of categories by hero. Putting aside the giant flashing ethnological questions of a system of organization based only on language and lead male star, I was really surprised to see names like Anil Kapoor, Jeetendra, Vinod Khanna, and Shashi! It's like they knew I was coming! I only wish I had known about this place years ago; as of May 2011, I already owned all but two of the forty-plus DVDs in the Shashi category. I snapped up those two, neither of which regsitered in my mental file of missing Shashi movies, and I'm now the proud owner of unsubtitled copies of Yeh Dil Kisko Doon and Mohabbat Isko Kahete Hain. It appears that no one else has written about this film, which is a real shame not only because I thought it was very cute but also because the lack of subtitles means I'm missing some of the finer points of the story. As far as I can tell, the basic plot focuses on a young man who runs away from home and joins the circus. Oh yes! 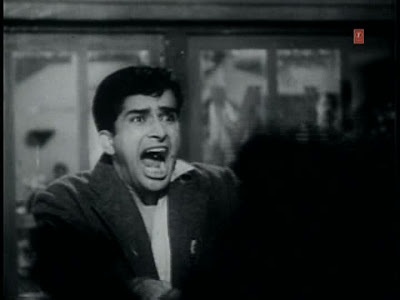 Establishing shots of a mansion and a very somber voiceover suggest that Shashi (let's go with actor names this time around) has it all, but after a big meeting with a group of applauding old men in suits, in which I suspect he has been named the sole heir to or head of an estate, he mouths off about love, friendship, and work, dashes away in his convertible, manages to give the slip to a motorcycle gang following him (yeah, I have no idea about them), and accidentally careens off a bridge, proving it is never too early in one's career to worry about driving like a Kapoor. Unconscious, he washes up on the beach, where he is found by Agha and Jayshree Gadkar, who shelter him for the night and probably have philosophical conversations about whether money can truly buy happiness and all that jazz, though I'm not certain about that bit. Waking early the next day, Shashi leaves his nice suit and a wad of bills with them, setting off in patched clothes, free as a bird. 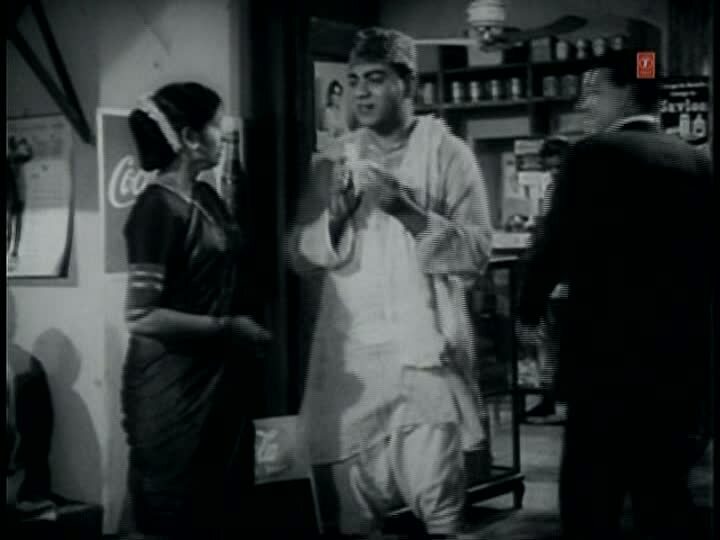 Agha and Jayshree go off to a restaurant to plot their next move. Unexpected delight #1: in very brief walk-by cameos, Mehmood and Shammi Kapoor greet them with "Ram Ram" at the door of the restaurant; upon consultation Memsaab has allowed me to refer to Shammi cameos as "Shammi-os." Agha then goes to a newspaper office, I think to report Shashi missing; this kicks off a side plot of many different men in various outfits signifying profession or ethnic group trying to find Shashi, and I am not clear whether they were henchmen (like the motorcyclists), selfishly after a reward (given that he is very rich), hired by the suited old guys from the beginning to bring Shashi back home safely, or just looking for their cash cow. 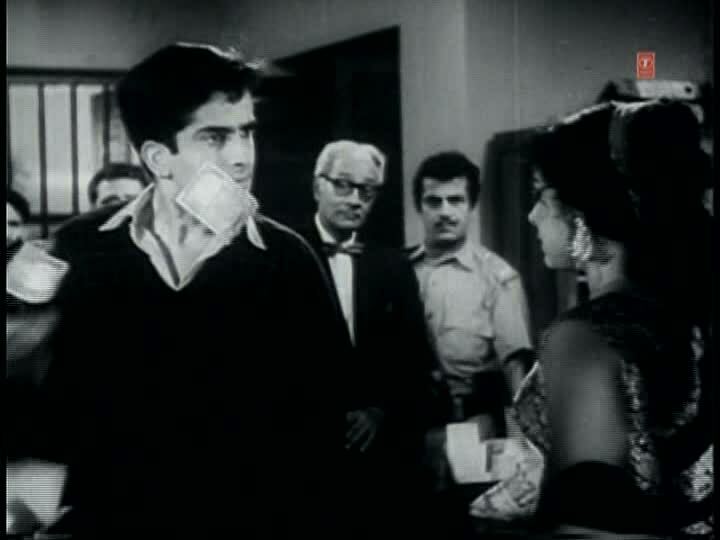 Shashi too goes to a restaurant and seems to have forgotten he gave away all his money. Unexpected delight #2: fortunately, just as the waiter and owner give him the bum's rush out the door, he crashes head first into...a bear! As far as bear suits go, this one is not nearly as moth-eaten as it could be and seems to have a nice shaggy coat and a head that fits relatively snugly onto the body, creating a halfway decent, if anthropomorphized, bear effect. Shashi runs screaming from the bear straight through the restaurant window and somersaults over a table. General pandemonium ensues with customers running around, the bear growling and lunging, and Shashi hurling furniture at it. The bear picks him up by the waist, spins him around, and even lifts him over its head! I must break from narrative for a moment to try to express how happy I am to have seen Shashi Kapoor fighting a bear in 1963. This is a dream come true—a dream I didn't even know I had! I've never seen him fight any animals, real or costume, and if I had dared to hope I ever would, I would have put money on it occurring sometime after 1975 and also involving Amitabh Bachchan and possibly Pran. I cannot find this scene online, but here is a collage of some of its highlights. You will probably say to yourself "Ah, of course" when I tell you that the bear belongs to a girl, in this case Ragini, who works at the circus. And if intervening in a bear attack does not qualify for meet-cute, I don't know what does. After the incident is featured in the news, Shashi becomes a celebrity and people start giving him things, including food from a stall in front of a poster of his earlier film Prem Patra, which he immediately gives away again, determined to...be poor, I guess, as an outward expression of breaking free from the stifling monotony of wealth? Unexpected delight #3: poor but happily unencumbered Shashi skips down the street playing a a harmonica and bursts into the title song, leaping, spinning, flinging his arms every which way, and exaggeratedly kicking his feet up behind him. Who knew Shashi could make such an exuberant ragamuffin? 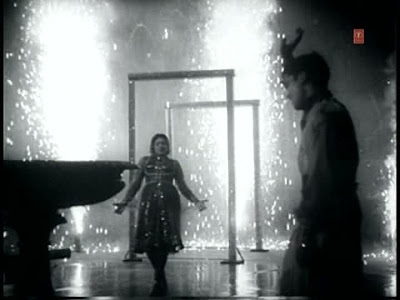 Shashi eventually meets up with the circus, where he is smitten at first song, as it were, with Ragini, now featured as the show's lead musical act. Recognizing him from the bear attack, she takes him home to meet her dad, Anwar Hussain, a "trapeze king" now alcoholic and long past his glory days. Over a pepper sandwich, Ragini and Shashi get to know each other. 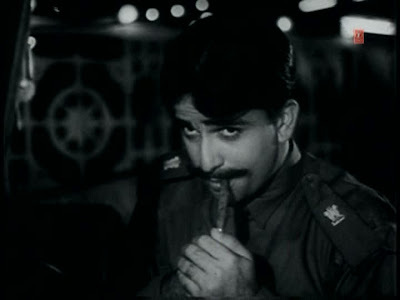 Unexpected delight #4: Shashi teasingly answers Ragini's question of whether he has wife and kids by counting on his fingers "Kunal...Karan...." After admitting his joke over a mouthful of scorching mirchi, she takes him to circus boss Jeevan (not quite as creepy as usual, possibly because I didn't know what he was saying), who gives him a job as the living target of his knife-throwing act. The movie continues on in the predictable "boy and girl fall in love and overcome obstacles" vein, but I thought it was a treat through and through. There is but one objectionable moment in the whole thing: Shashi has been led to believe (falsely) that Ragini is in love with Jeevan, and he strikes her in the face. For the first time I can remember, we actually see the effects of a tight slap, an important reminder that the physical pain of the instant may fade quickly but the emotional pain can linger. Interestingly, Ragini has an almost reciprocal action; not ready to forgive him, she hurls money in his face, and the camera treats this action in the same way it filmed his slap, looking straight at the actor and letting their arm almost cover the lens as the blow approaches. But back to the things I loved...which is everything else! The circus setting makes for a lively and varied background cast and set, and even their silent presence in various scenes added a big splash of fun. I've never seen Ragini before and thought she did a great job as the confident, competent female lead. I don't even want to call her a heroine because that seems too reductive. Despite the only-in-a-movie setup of walking away from wealth and joining the circus, Shashi and Ragini's characters seem like real people—real adults, even—trying to balance pragmatics, love, and dreams. 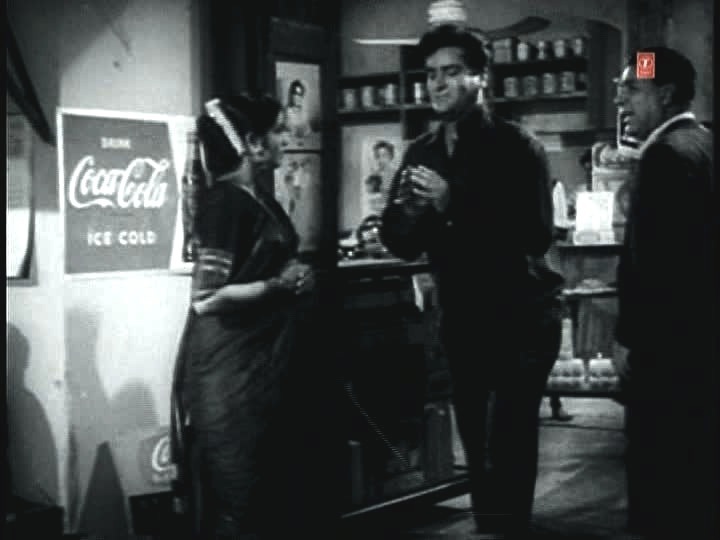 Unexpected delight #5: there are references throughout to other films and actors, and my favorite was this one, Dev Anand's Chortling English Accent Twit from the just-reviewed Hum Dono, even accompanied by the tune from the musical lighter! Iqbal Qureshi's songs (including how they are sung, costumed, choreographed, filmed, etc.) are without exception entertaining and emotional—and very often gorgeous to boot. 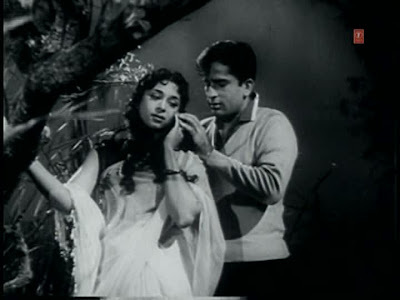 "Kitni Haseen Ho Tum" features a stylized romantic moonlight night on a lake. So lost in this dreamworld are the lovebirds that they miss her scheduled performance time in the circus, which causes her wobbling dad to return to his trapeze in a pique of "the show must go on!" (I will digress just a bit further to add that in order to add a big flourish to his act, he decides to do stunts blindfolded and without a net. 'Cause that'll go well.) "Phir Aane Laga Yaad Wahi" is another entrant into the "songs with giant props" category. Despondent, drunken Shashi imagines tiny Ragini dancing in his drink, then on the surface of his table with ashtray, still-smoking cigarette, and bottle. It's possible there is also a letter holder on this table? Or maybe it's for napkins? Also: her skirt in this sequence is black with silvery sparkles, almost like she's wearing the night sky. I love it so much! 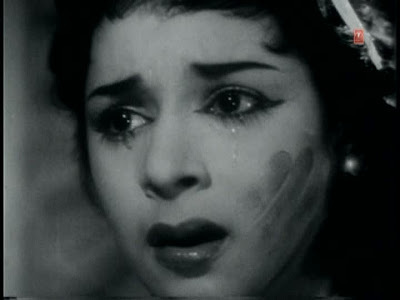 The song ends with a tempest, with tiny Shashi tossed into the set and both of them staggering around as grief and tears threaten everything. It is glorious: the emotions, the music, the dancing, the rain, the fireworks, all of it. And my favorite, because I will almost always prefer laughter and grooviness over longing and drama, "Jab Tak Duniya Rahi Rahega," in which Ragini and Shashi...well, frolic, I suppose, on an minimalist background with instruments, music notes, and giant playing cards before walking off along a path lined with fairy lights. Danny Kaye-type moment: he's got a cane! There are several people in the film I would like to match up with names. Can anyone help identify these women? Lady A (who is very familiar!) plays Ragini's romantic competitor, a fellow circus performer who is not above schemes to try to snare Shashi. 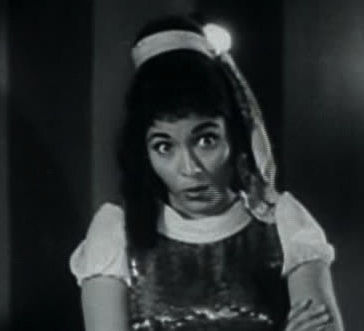 Though as Memsaab pointed out, maybe she just seems familiar because she looks like Mary Steenburgen. Lady B stars with Jayshree Gadkar in the lovely dueling tawaif number "Humein Dum Dai Ke." 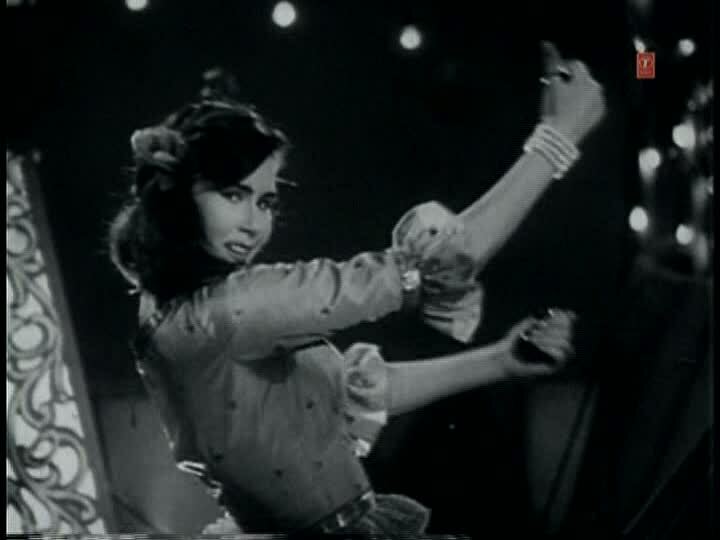 Lady C has a flamenco interlude in "Kya Hua Maine Agar," another number full of energetic, joyful romping by Shashi and Ragini and set among the bright lights and costumed onlookers of the circus. Coincidentally, while combing through my most recent haul from the library's Filmfare collection, I found a review of the film from the May 3, 1963 issue. An excerpt: "This 'Dil' is the cross of Shashi Kapoor, possibly one of the most authentic of young talents in the industry but still in search of a worthy film. Shashi works hard (e.g. he romps singing and dancing on the roadside, fights a studio bear, hides his handsome face in a circus clown's wig and rubber proboscis, and gives delightfully irreverent take-offs on matinee idols, two of them his real-life brothers) to save the film, but 'Dil' heartlessly keeps sinking." Click on the picture for a readable version. I was surprised they gave it only one star, not only because I found the film interesting and delightful but also because the words in the review don't make it seem quite as dire as that lonely star suggests. But don't listen to that critic from almost fifty years ago! This is a funny, cute little film with some real treasures, whether they are of the "gorgeous emotional song" variety or simply "Holy moly, that's Shashi Kapoor fighting a man in a bear suit." Or both! I think my head kind of imploded when I tried to conceive of cataloguing films by hero. What about the multi-starrers? Where does Burning Train go?! This film sounds perfect. Circus, bear suit and Shashi. With film references thrown in. The girl in the wine glass was beautifully done in 'Tere Ghar ke Saamne', Dev Anand and Nutan. I have see Shashi duel Rajnikant with a flashlight in hand. But this certainly sounds interesting. 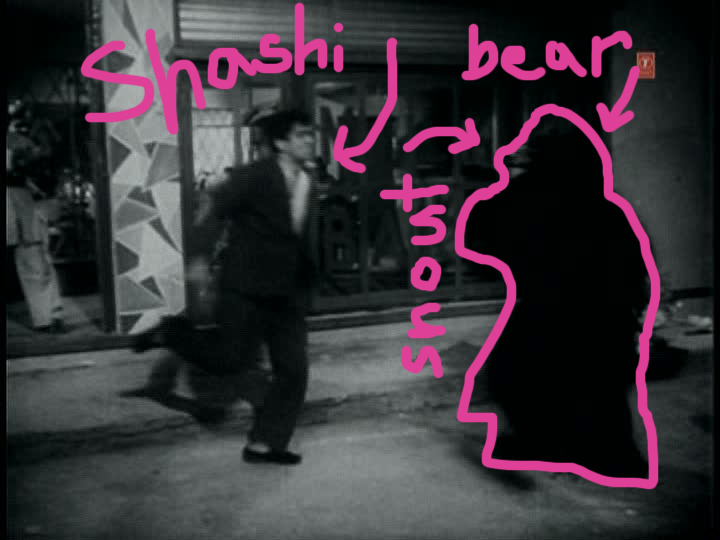 "Shashi Kapoor fights a bear" WANT! ... Too bad there are no subtitles. Ness - I was thinking about you as I watched this and my tentative recommendation is that he is probably a little too bouncy and non-emo in this for your taste. Sadly I am quite confident there is no Shashi and Amitabh vs an animal film because I have seen all but two of their collaborations (and all of them from the prime era likely to have such a thing). WOE. I would love to investigate the whole "sort by hero" thing. It's such a great indicator of the centrality of the hero! And you're right - what about the multi-starrers! I bet Burning Train would go under Dharmendra? I wish I could remember if it was in the Vinod section! Next time I go to that shop I will photograph the Vinod area for our enjoyment and perusal. Banno - It IS!!! I'll have to look for "Tere Ghar Ke Saamne." I love songs with mini people and huge props! Vinayak - I've seen that too and it was quite something! Katherine - It's like you're trying to wind me up :) I feel compelled to say that given the range of stuff Shashi has done, it would be very odd for there not to be a single film you find intriguing! Shyam Benegal! Bimal Roy! Merchant-Ivory! Manmohan Desai (are you immune to the idea of a film about a single father who is a roller-skating instructor?)! I think this one stands up without subtitles well enough - it's visually and aurally very pleasing. This one has such lovely songs and dances, and Shashi's mimicry is quite fun, too. For the rest, I must admit that I agree with the reviewer of fifty years ago. Shashi's character is way too obsessed about finding "true love" (that's why he runs away from his trustees who advertise a reward for information about him, hence all the people after him! ), and when he does find it, the romance just doesn't work (not for him and not for me!). Moreover, there is way more Ragini in the film than I can take in one go. By the way, if Shashi fighting animals is your thing, you might want to try out Jaanwar Aur Insaan where he fights a tiger. No Big B, and not a lot of great masala, but a film about him stalking a tiger and actually hand-wrestling him! @Beth: YOU MUST go back and find where they keep Burning Train! It's going to vex me (but you're so right, I bet Dharmendra gets to be hero, even though VINOD! And I have much love in my dil for JEETU! too) Ahem. Anyway. @Katherine: just to chime in on what Beth (who IS the expert) says, as someone who is not so much enamoured with the Shash: Aa Gale Lag Jaa! Manmohan Desai! Roller skates! I may have been prejudiced because of Shotgun but whatever, I actually did enjoy that one (and actually FINISH it). @bollyviewer: doesn't matter WHO is doing the tiger wrestling, SEEING IT! Bollyviewer - Really! Hmm. Maybe my ignorance is bliss in this case? What don't you like about Ragini? I found her very real somehow. ANd yes, I MUST see Jaanwar aur Insaan! I smell a watchalong! I'm also with you on the necessity of the tiger wrestling regardless of who's in it. Oh, Beth, no, not trying to wind you up, no, no. I'm just oddly perplexed. HOWEVER! Based on it being A. Desai and having B. ROLLERSKATING, Aa Gale Lag Ja is actually currently sitting very high on my Induna wish list. So I shall listen to you and Ness, and keep trying, Shashi-wise. Forgot to mention: the grocery where I go to get Malayalam DVDs also categorizes films by heroes. They have a top shelf (labelled "miscellaneous") that I can hardly reach which houses all the stuff that doesn't fit anywhere else. Let's not think about what that says about the heroines, eh? It's been so long since I watched "Yeh Dil Kiss Ko Doon" (why to Beth of course, Shashi) that I don't remember much about it except for the "jab tak duniya" song which I agree is utterly cute. I do share bollyviewer's unfondness for Ragini - great dancer but unappealing as an actress. Word of caution on "Mohabbat Issko Kehte Hain" - it's a downer. Take appropriate precautions. Can't get enough of those vintage Filmfares. 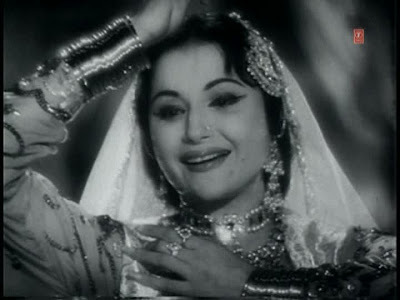 Lady B looks like Madhumati not dressed as Helen.